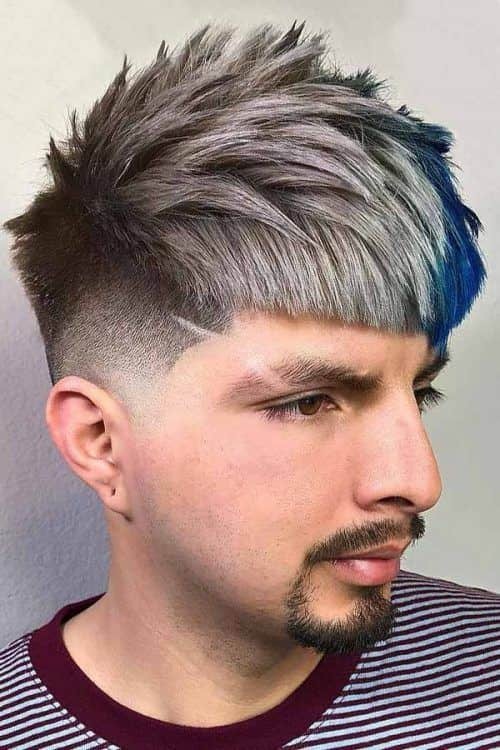 Silver hair men trend is growing very fast. Whether you have natural gray locks or prefer to have them dyed, there are many hairstyles that make ashy hair pop. 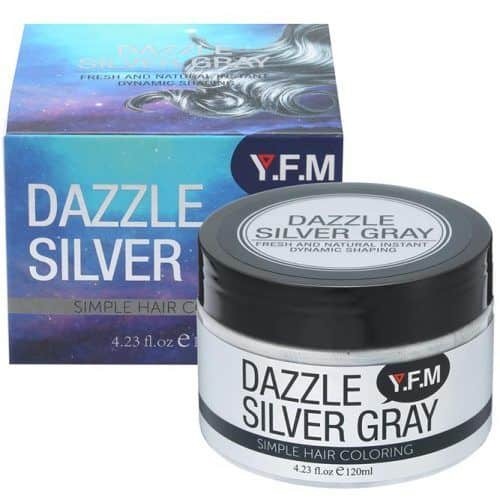 Although it’s highly recommended to visit a colorist for a hair color change, you can achieve this silver gray effect with special coloring products. Stay tuned to find out more details on the topic. 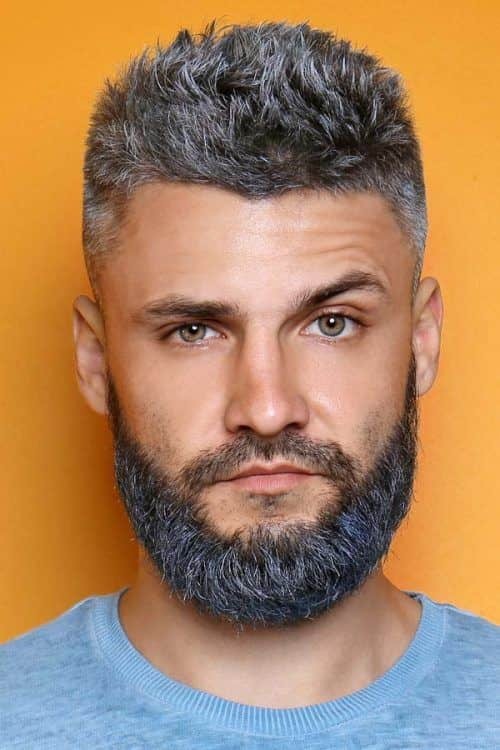 How To Dye Hair Gray? The silver hair men trend has stormed into the fashion world and is definitely not going to depart from it that easy. 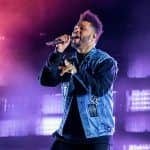 Being introduced by celebrities, this controversial hair color is now commonly sported by everyone no matter of the age group. Mature men don’t shy away from harnessing their graying locks anymore while youngsters deliberately dyeing their manes in ashy shades. So, what is it, a passing trend or a serious fashion statement? Let’s sort it out together. You may google how to get silver hair color permanently as much as you want, but the best answer will always be to make an appointment with your hair colorist. If you try to bleach and tone the hair yourself, it may give you very unpredictable results, from an uneven color to damaged hair. However, if for some reason, it’s impossible for you to visit a hair salon, we’ll tell you how to dye hair without bleach. There are special hair color toning products that don’t dye your hair but rather cover it with a coating, which visually makes your hair appear another color, including but not limited to silver. Even though the result with a such silver hair dye is temporary (it washes off as soon as you get into the shower), it’s not only less damaging but completely harmless to your hair. Silver Hair Colour has a liquid formula that’s perfect for lighter hair shades. It’s highly popular with celebrities, who use it to create a natural aging appearance without damaging their locks. 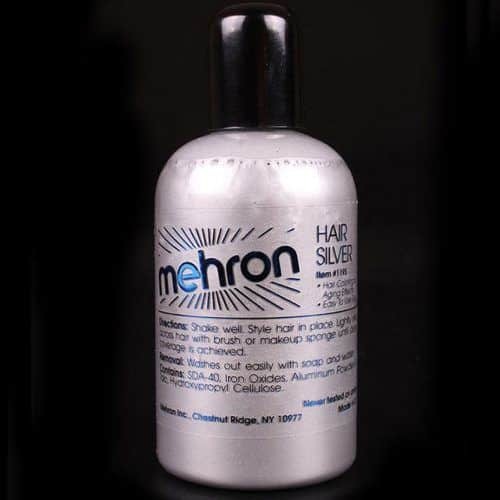 This silver hair wax not only harmlessly colors your hair gray but also delivers all-day hold. An ideal option for a masquerade or Halloween party. 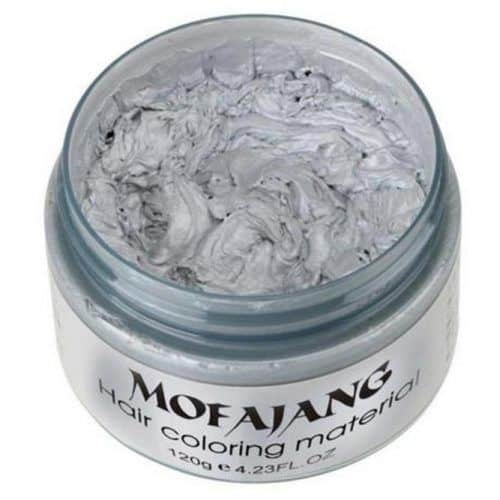 Mofajang hair color wax is absolutaly natural, hence isn’t harmful to your hair and skin at all. Along with coloring, it provides you with effortless styling. Sooner or later, your hair will lighten up with silver highlights. There’s no need to ax yourself. Silver hair men life not only goes on but also gets a new twist. Thus, you should embrace your grey hair color and bring it to the new level of mature edginess and attractiveness. Take care of your locks with special purple shampoo, styling products with a matte finish and regular grooming, and it’ll fully pay you off. Don’t wash your hair too often to prevent the color from fading. Switch to SLS-free shampoo and conditioner, which don’t pull the color from the hair. Find the color-safe shampoo and conditioner that suit your hair type. Use color-depositing products once a fortnight, which will protect your hair from yellow brassiness caused by oxidization. Opt for silvering UV protecting shampoo and conditioner. Utilize toning kits that neutralize and brighten faded patches. 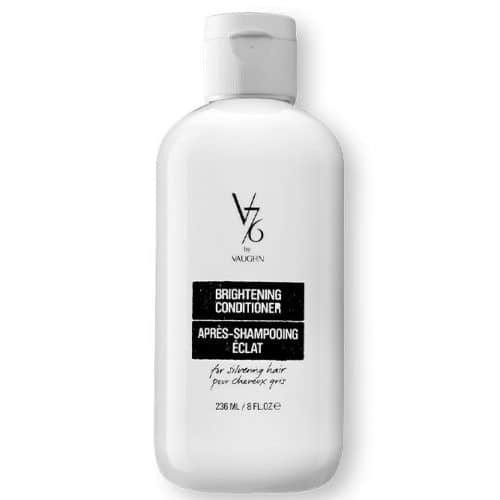 Arguably, V76 by Vaughn is the best shampoo for gray hair, as well as white and blond. It softens and moisturizes coarse locks making them brighter in the course of time. With this shampoo for grey hair, your mane will feel soft and look luminous. The gray hair care wouldn’t be complete without a special conditioner. 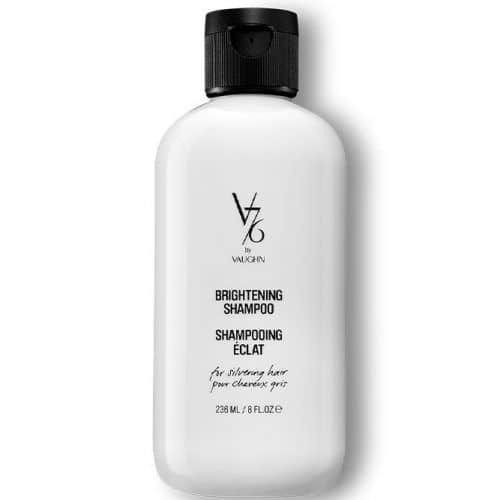 V76 by Vaughn enhances the effect from the shampoo as well as makes the scalp nourished and the hair strong and repaired from oxidization damage. Opt for the styling products with a matte finish, which doesn’t reveal a yellow tone. Switch the pomades with the oil base to a styling clay. Thus, your hair will gain more texture without looking overly greasy, which works perfectly for short grey hair styles. Spritz an oil-based spray over the clay to achieve natural texture. 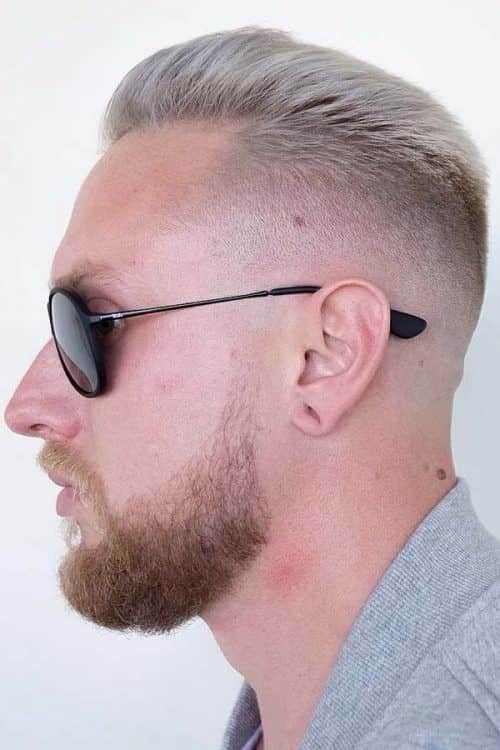 Along with treatment, silver hair men should pay enough attention to styling. There are plenty of flattering hairstyles for gray hair that will make you look classy and fancy. 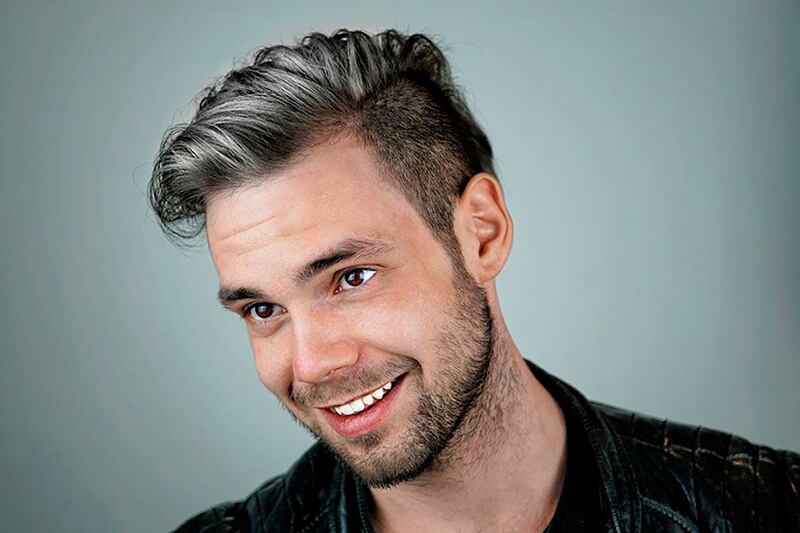 Here are the most appealing gray hair styles to choose from. A classic comb over is a platinum standard of gray hairstyles. If your hair has only started its silvering journey, the grey highlights will add movement and vitality to it. 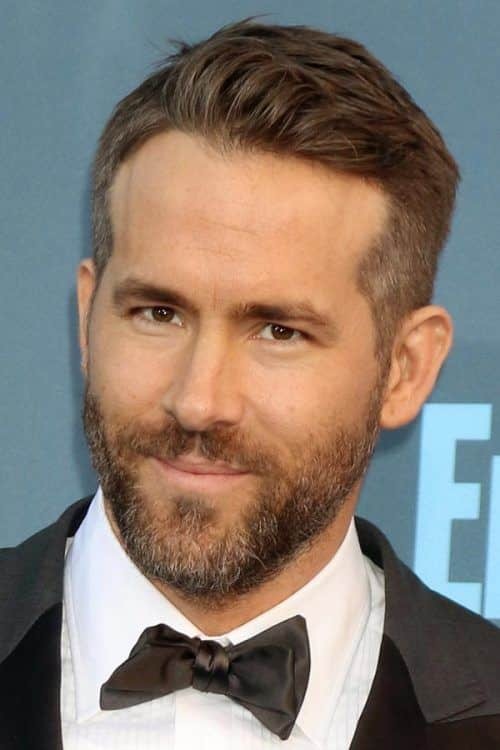 If you have dense platinum grey hair, show it off with your haircut. 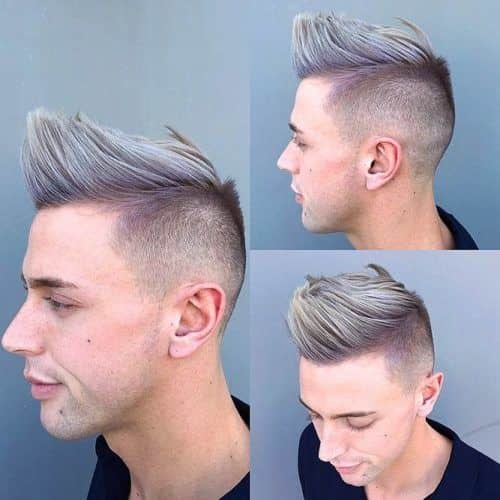 Go for short silver hair on the sides and longer on the top and accentuate it with a side part. In this way, the gray hair trend adds a modern touch to a classic look. 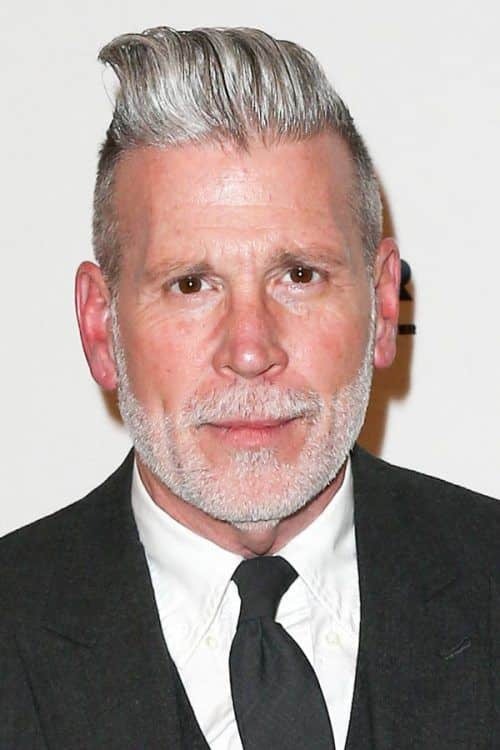 When dark grey hair melts into grey brown hair, it creates a shimmering ribbon effect that makes you the King of the silver fox men. The textured crop haircut is so much in vogue now, and with silver grey hair, you can give it an unusual kink. However, don’t limit yourself only to single color. Cropped black and silver hair with blue strands will give you a true killer look. 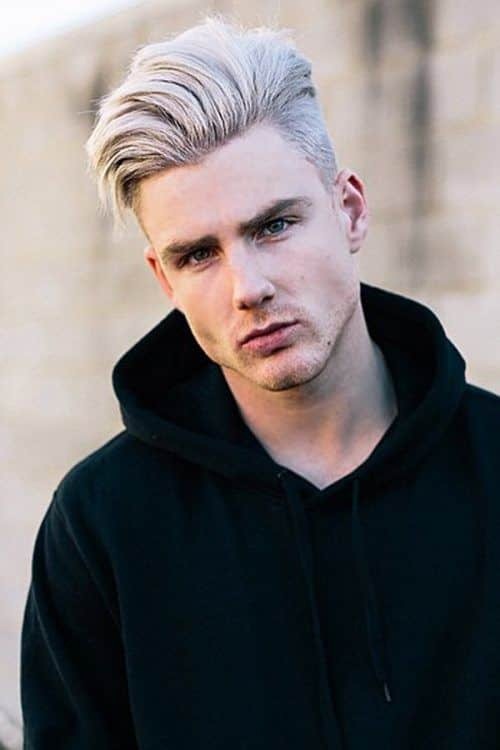 White hair men usually have this elegant flair that keeps your eyes glued to them. 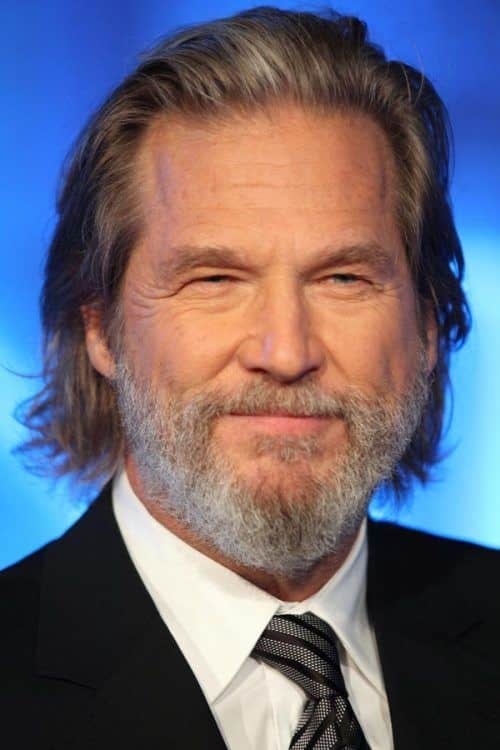 Elegant and dapper slicked back hairstyles for older men, of course, add to this effect. 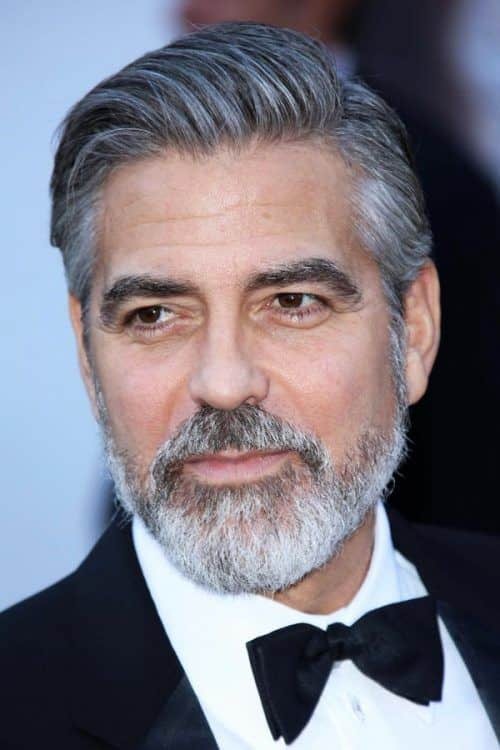 To make a real silver fox men look, team your hairstyle with a smattering of facial hair. Long gray hair is a staple of Silver Foxes League. Note though that the longer your gray locks are the more maintenance they require. You don’t want to look like an old fogey, do you? Add some texture and direction to your ash grey hair by brushing it up at the front. This look comes out stylish and trendy with a little styling thanks to trimmed sides. 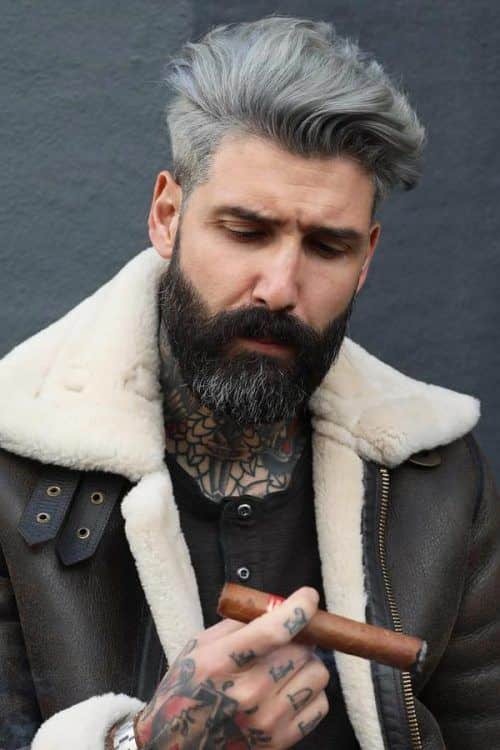 Grey hair men like to create contrasty and striking looks. Give your hairstyle another bold vibe with undercut sides. Messy locks have never looked as daring as in short grey hairstyles. This age-erasing style will give your short gray hair a real bad boy look. How can grey hair styles be made even bolder? Easy. If harnessed by black men. Silver braids create unbelievable contrast with dark hair and skin, which is a win-win combination. 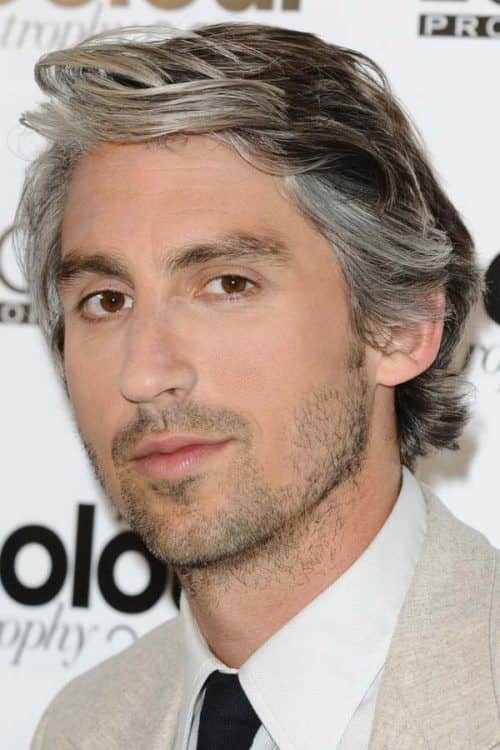 Not so long ago, silver hair men made a lot of effort to disguise the fact of going gray. Though today, they not only embrace their changing hair color but also learn to make the most out of it. Moreso, guys who are still far away from aging, consciously tone their hair gray. The reason is on the surface. 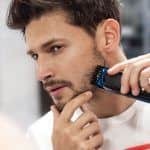 There are tons of men silver hair styles that prove that this trend is timeless.